My heart fluttered. Rarely do I know my Monday article assignment so far in advance, and I spent the days building up unrealistic expectation for the Panthers against Tampa Bay. Facing an iffy—and familiar—Bucs defense, they’d light it up maybe to such a degree that I could even sensationalize them as a Super Bowl-caliber offense. By the time I turned on the Panthers-Bucs game on Sunday, I’d written just enough of the “Carolina’s offense is amazing!! !” article in my head to be positioned for a massive disappointment. But before I could even worry about a letdown, Cam Newton & Co. validated the thesis come true, scoring a team-record 35 first half points, and doing it, no less, through the exact means that had captured my heart a week ago. And so now you get the effusive, glowing breakdown that I’d looked forward to writing all week. Here goes: THE PANTHERS ARE SUPER BOWL CONTENDERS BECAUSE THEIR OFFENSE IS AS WELL-SCHEMED AS ANY IN FOOTBALL. New offensive coordinator Norv Turner deserves serious consideration for Assistant Coach of the Year. Shortly after this, D.J. Moore registered a 32-yard run on an end-around run out of I-formation (another unusual look given the play design). Soon after, McCaffrey capped the drive with a dive run, which would have been a classic, old-school football play if not for receiver D.J. Moore’s jet-motion before the handoff. These sorts of misdirection concepts have become the foundation of Turner’s scheme. Most of Carolina’s plays start out looking like one thing and become something else. No team has been better with deception, and Turner deserves a lot of credit. He’s made a career out of fashioning creative, but mostly traditional, downfield offenses. He’s doing that again this season, but with new-age wrinkles. A few years ago I had coffee with Turner’s son Scott, who is Carolina’s current QB coach and at the time was on Turner’s offensive staff in Minnesota. Scott’s first stint with the Panthers had been in 2011, Newton’s rookie year, and he had discussions with his dad about the RPO stuff the Panthers had done. (Yes, RPOs were around back then, but they were new and less common, so many people had not yet noticed.) Scott was impressed because his father was not just receptive, but curious and creative in embracing the RPO. In fact, Norv even installed it for Teddy Bridgewater in Minnesota. “It spoke to his humility and flexibility,” Scott had said. We’re seeing that humility and flexibility more than ever this season. Recognizing that Carolina had one of the league’s most challenging rushing attacks, thanks to Newton’s unique mobility, Turner kept the ground game playbook pages mostly in place, even maintaining a lot of the verbiage that Newton & Co. had learned under previous coordinator Mike Shula. It helped that the man-blocking designs Turner has long favored naturally fit. Turner has never before coached a QB with Newton’s mobility, and through half a season he’s leveraging Newton perfectly. 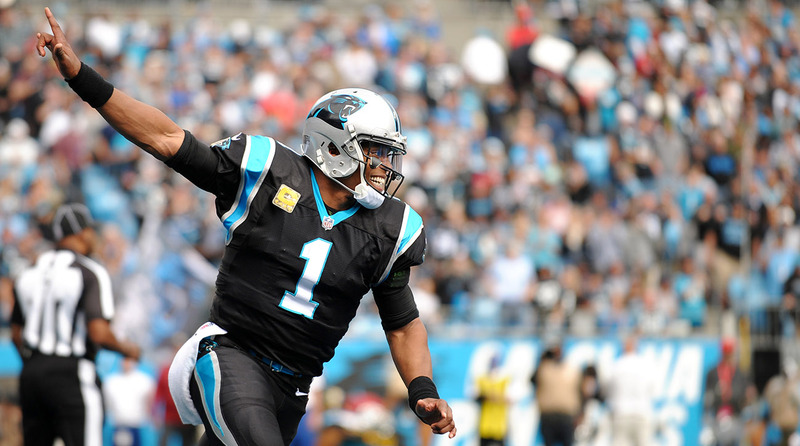 Newton’s mobility—or, more specifically, the threat of his mobility—is foundational in many of Carolina’s defining misdirection and multi-option plays. In the third quarter Sunday, when the Bucs were clawing back and got within one score, a small pit in my stomach started to form. What if the Panthers couldn’t do what any Super Bowl caliber offense would do, which is protect its hearty lead? Did they have the chops to pound the game away? Last season, traditional runs that did not involve Newton were a bugaboo for this offense, in part because the offensive line is not overly talented. But instead of trying to ice the game by just hammering the rock, Turner dug in on the misdirection. After a 20-yard tight end throwback to Greg Olsen (offense goes right, Olsen leaks back across to the left), Turner called back-to-back read-options for Newton for gains of seven and six yards. A few snaps later, the Panthers aligned in a bunch formation that forced Bucs corner Davis to play with outside leverage. Wideout Curtis Samuel easily beat that leverage on a deep in-breaker that ended up near the seams. Newton, whom Turner realizes is not always a precision accuracy passer but is one of the league’s best power throwers near the seam areas, fired a strike for a 19-yard touchdown. All was well in Charlotte. The Panthers are not as talented as the Rams, Patriots or Chiefs. But the best schemes are those that rely not on talent, but on the details of execution. You can feel confident that this offense won’t break your heart.